Yesterday (Monday 30 September 2013) was a public holiday in the Australian Capital Territory (Family & Community Day) and not in New South Wales. Our jobs are in the ACT and Cliftoria is in NSW. It was a perfect opportunity to get quotes. So Sharen had arranged for a string of trades people to turn up at Cliftoria to provide quotes for various repairs. Mostly quotes were for the roof but also a clean. Having been a set of flats since 1925 it really needs a general clean. We had people turn up to work on the electrical switchboard and its excessive meter issue. Also plumbers to deal with the leaking water pipe and the ex kitchen pipes that hang in mid-air. As an added bonus to the day we also had a few friends turn up to wander through as well. I’m not a fan of waiting for tradespeople to turn up so having so many scheduled made it less bothersome. Especially when the 9:00am ones turned up at 4:30pm. I do understand that things can happen to delay people but seven and a half hours is a bit much. One of the electricians had very recently worked on Cliftoria, after the previous people had left, because the Real Estate Agents wanted the building safe for viewing. He walked through with us pointing out the work they did. As he heard it the previous tenants had been doing the conversion from flats to an Art Gallery in return for free rent. Alas they don’t appear to have had the skills to do the conversion. After taking down a couple of walls, put in during 1925, they removed a lot of doors and the door frames. Apparently some of the door frames had power points built into them and they had left wires exposed. A lot of lights had been removed by simply cutting them off leaving the bare ends of the electrical wires exposed. So that is the reason why some of the ceiling roses have brand new modern single bulb fittings on them. He told us that the wiring for the lights is only two strand cable and while currently is safe it will need to be replaced with cable containing an earth wire when we do work on them. I’m glad that the building is electrically safe but I now wonder at what the lost light fittings looked like. Elegant chandeliers I’m sure. 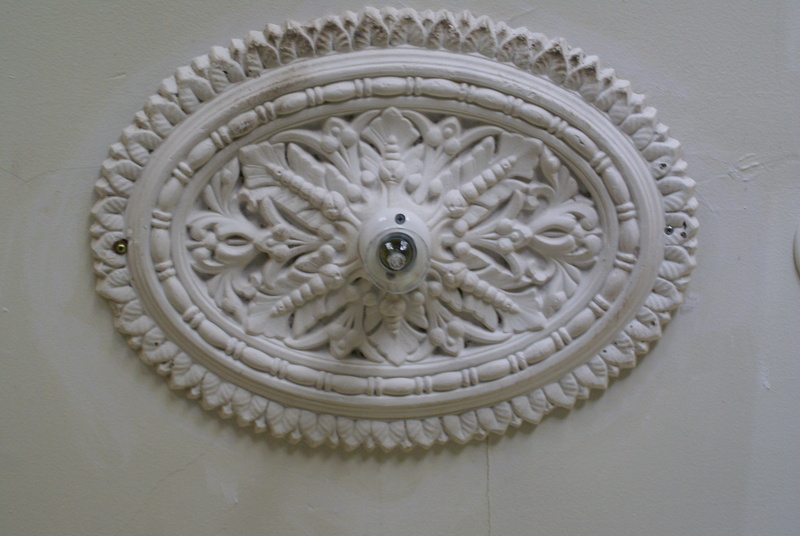 A ceiling rose with a new light fitting. The good news was that all 3 roofing people agree that the main roof was in pretty good nick and didn’t need replacing. The box gutter between the two roof peaks is causing the leak so replacing that should be fairly easy. That is good news. The stable roof and front veranda do need replacing as do some of the guttering. Surprisingly there appears to be fairly new (only a few years old) guttering in a few places. Other places it has rusted through. We are now waiting for the written quotes to make a decision as to who we will get to fix all the roof bits. 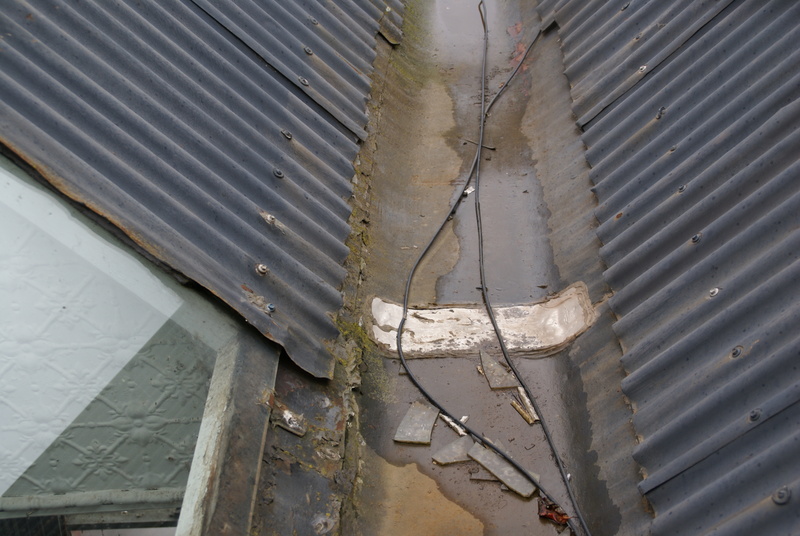 The big box gutter on the roof showing evidence of recent raining. Notice the main roof iron is in good condition. The window on the left is a skylight into a kitchen. We set an electrician (level 2) to work on removing all six meters and replacing it with one meter. Apparently we can’t get five removed for technical reasons. 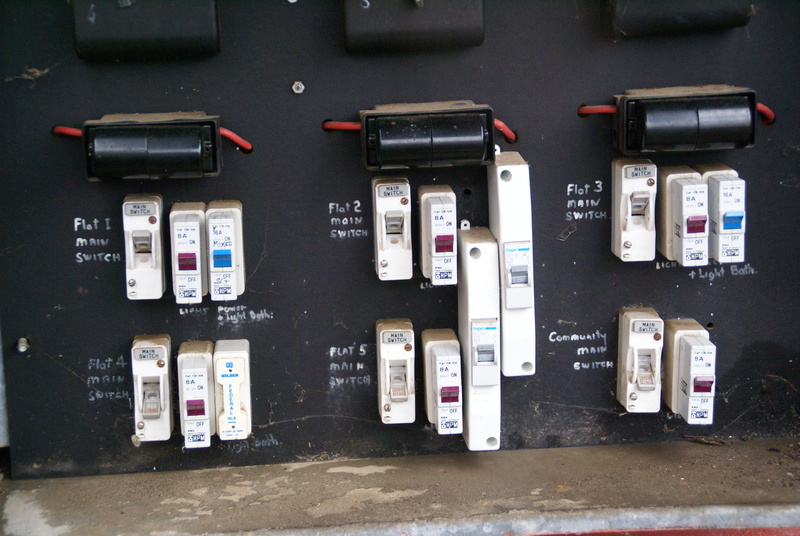 Also the individual fusing elements will be replaced with a more up to date set of circuit breakers. The fuse switches for the 5 flats and community areas. One of the surprises is how fast the vine has burst into life. I like how it looks. I don’t like the damage it is causing. It is very invasive and has grown through all sorts of places including lots of the guttering and so prevent them from working properly. My next visit will be concentrating on removing as much as possible of the vine. 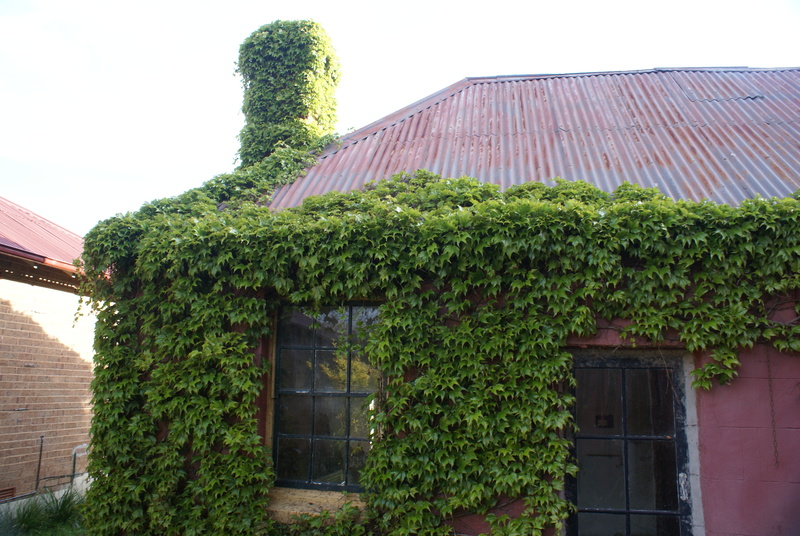 The vine-covered stable springing into life as we are in Spring. Notice the rusting iron that will be completely replaced. 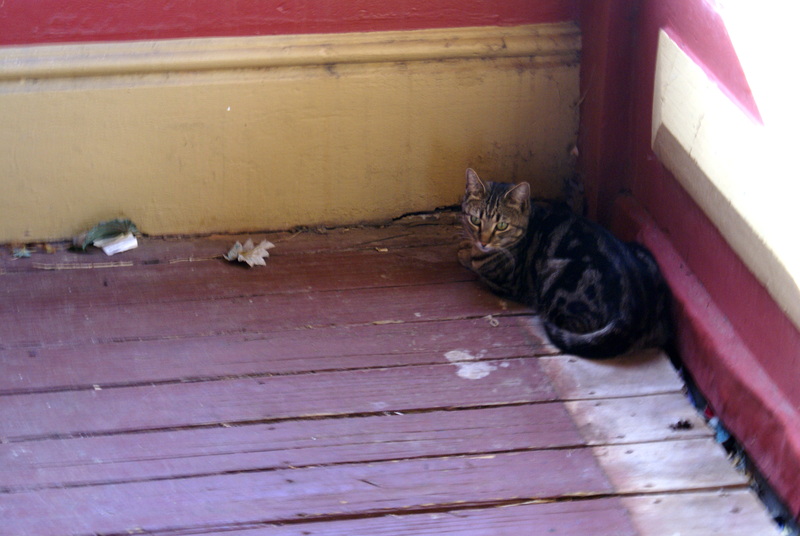 One of our visitors was a neighbourhood cat that wandered in through an open door and up onto the balcony. It lurked in a corner for quite a while before leaving. Over all it was quite a nice day and I enjoyed being there even though I didn’t get to do much useful work. That vine is lovely though. But if it is causing problems I understand it must go. It looks like the vine that we had growing in (literally) and around the shed in our previous house.